The Rebel Sweetheart. : Foodie Goodie | Tacos Deluxe. What to do with left-over ground beef? Make tacos, of course! Tacos are perhaps one of the easiest dishes to make, plus you call the shots on what to put in it. 1. In a small bowl, mix chili powder, garlic, cumin, salt, coriander, paprika and black pepper. 2. In large skillet, heat oil until it shimmers. Add onion and cook 4-5 minutes or until translucent. 3. Add the seasoning mix, stir it so it combines with the onion. Cook for about a minute. 4. Add the beef, make sure you break the chunks so it cooks through properly. 5. Once the beef is cooked, drop the tomatoes and salsa, stirring to combine. Cook for about a minute, or until heated through. 6. Heat taco shells according to packaging directions. 7. Divide meat mixture among shells. 8. Serve with lettuce, cheese, sour cream and guacamole. Hubby love this and I always make it. This is yummy! 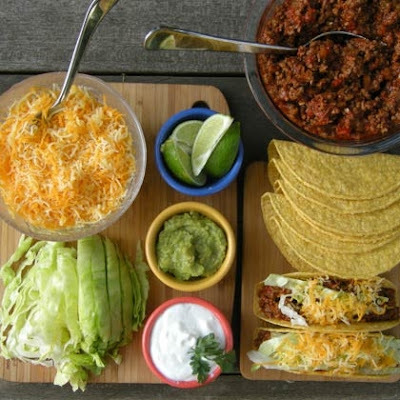 The Tacos looks real good and you can play with different flavors and condiments. very easy and well described by you.nice one. Why do I have to see this post at this hour?! Now I'm craving! OMG! Yummy! What a great idea for dinner! I haven't done those in a while because it's so much work and I hate chopping veggies but it's sooooooooooo worth it! Good stuff! TACOS!!!!! I love me some tacos!!!! Now, do I want to make my own with those yummy ingredients, or go to Taco Bell cuz I'm feeling lazy? You know what... we really have something in common lol! I just made a taco for my kids last week...me and my kids love it and I like doing it because it's very easy to prepare! lol... thanks for the recipe... I might try this also..cheers! This sounds so good--my husband would love it! Thanks for sharing it! We love our Tacos night. We love our Tacos night! i love tacos, the last time i made one is this new year and the kids was totally excited to eat. i think it's time i have one...usually i reach for burritos. lol. appreciate much your taking the time to share and link over at Food Friday, Czjai! I love tacos too! I always use the McCormick mix, easy to prepare.